Perrin Conferences will host the New York Asbestos Litigation Conference on December 4, 2018, at the Wyndham New Yorker Hotel in New York City. The New York Asbestos Litigation Conference will be held on December 4, 2018 in New York City. WAYNE, PENNSYLVANIA, UNITED STATES, November 20, 2018 /EINPresswire.com/ -- Perrin Conferences, the leading national provider of joint plaintiff/defendant litigation conferences, will host the New York Asbestos Litigation Conference on December 4, 2018, at the Wyndham New Yorker Hotel in New York City. 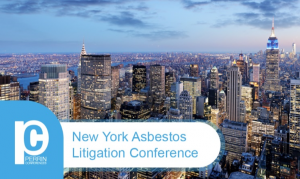 This one-day conference will bring together leading attorneys and industry professionals for a series of noteworthy panels and key discussions focused on New York asbestos litigation. Agenda topics include “The Judicial Perspective,” “The Plaintiff’s Perspective,” “Settlement Negotiations,” “Appellate Roundtable,” and more. All in-house counsel and insurance professionals receive complimentary attendance at Perrin Conferences’ live conferences. Registration includes private access to course materials and all networking events. In addition to providing exclusive opportunities for learning, networking, and information sharing, the New York Asbestos Litigation Conference offers Continuing Legal Education (CLE) Credit for qualified candidates. For more information on group discounts, registration, and hotel accommodations, please visit www.PerrinConferences.com or contact Bethany Corio. The leading national provider of joint plaintiff/defendant litigation conferences, Perrin Conferences offers comprehensive and specialized continuing legal education in an atmosphere of learning, networking and sharing. Bringing together preeminent national talent in specialty legal fields, Perrin Conferences ensures its conferences deliver innovative content, networking opportunities and career development. Attendees gain insights that cannot be found anywhere else. Follow the latest news from Perrin Conferences on Twitter @PerrinConf. For more information on the company and upcoming conferences please visit www.PerrinConferences.com.